Gene Roddenberry was an extraordinary man. He was a bomber pilot in World War 2, a policeman in the Los Angeles Police Department a scriptwriter for television (specializing in westerns and crime dramas) and the creator and guiding light of possibly the greatest Science Fiction series ever seen on television, Star Trek. In the series, he created a future in the 24th Century where the Earth had overcome the huge problems of rival ideologies and divisions by race and religion and had embraced world government. “The United Federation of Planets” took the concept even further whereby the early pioneering space flights in the 1960’s (when the series was first written) would lead man to explore space “The Final Frontier” not for conquest and gain but to develop our place in the Universe and learn about other cultures/races/beings. Indeed an “alien” being from the planet “Vulcan” was one of the stars of the series in the shape of the pointed-eared logical “Mr. Spock” (bottom row, right). Although it was always discussed throughout the series, the struggles of humanity to reach the stage of world peace and government were never gone into in any detail. 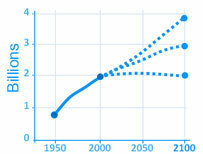 This week I have started a new Mooc from “Futurelearn” about “Globalisation”. The course is directed by Professor Richard Baldwin of the Graduate Institute of International and Development Studies in Geneva, Switzerland. I have to say that I have found this a particularly fascinating and topical course given the many problems we are facing at the moment with the rise of nationalism and populism, international terrorism and the way that technology, in particular, has transformed the world, notwithstanding the continuing progress of Artificial Intelligence and how that may cause massive disruption in the future. The first part of the course looked in particular at a case study of China and we were able to watch part of a fascinating American Documentary series (originally on Discovery Channel in the U.S.) called “The People’s Republic of Capitalism“. I have to say that I found this series provided a real insight into how a predominantly poor and mainly agrarian nation has made massive and ferociously paced change into a booming capitalist economy (whilst still keeping a rigid communist party directing political life). The series showed how there have been tremendous winners and losers in the process. The people highlighted showed the transition from poor villages to the booming city of Chongqing, a city of 13.5 million people in southwest China a boomtown of luxury goods and nonstop construction, it is emblematic of the face of Chinese capitalism but is unknown to many in the west. We were able to see the vast difference between the subsistence existence of the surrounding villages and the bustling. increasingly rich industrialists who ran factories for big multinational companies using labour from the surrounding villages who paid very low wages by western standards but which was seen as a step up in by the workers from their previous village existences. One woman from a village is seen as using almost half her income to send her daughter to a local school so that she can have the potential to succeed in the booming capitalist economy. We see a newly rich couple living on a private estate in the suburbs of the city driving a large BMW car and importing a hugely expensive sofa from a prestigious American furniture manufacturer! I found myself watching a modern version of what it must have felt like to wander into cities like Manchester from the surrounding farmlands in the 1820’s as the Industrial Revolution in the U.K. was transforming not just one country but eventually the whole world. Now I would imagine that you are asking what all this has to do with Gene Roddenberry? Well, Professor Baldwin puts forward a view that globalization has actually been a force for good! He agrees that there are casualties and that the change from a subsistence existence in a rural economy to life in a bustling city like Chongqing but in the long run it actually reduces poverty and leads to longer lives with better health. This may not seem obvious in the cases of China and India where rapid industrialization has led to massive pollution in cities such as Beijing and New Dehli. Baldwin sees this as a process, exemplified by the “Satanic Mills” of early 19th century Manchester and the modern city where descendants of the poor workers who lived in slums when they made their way to the rapidly industrializing city now live longer healthier lives. 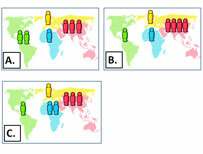 Has globalisation increased world poverty? 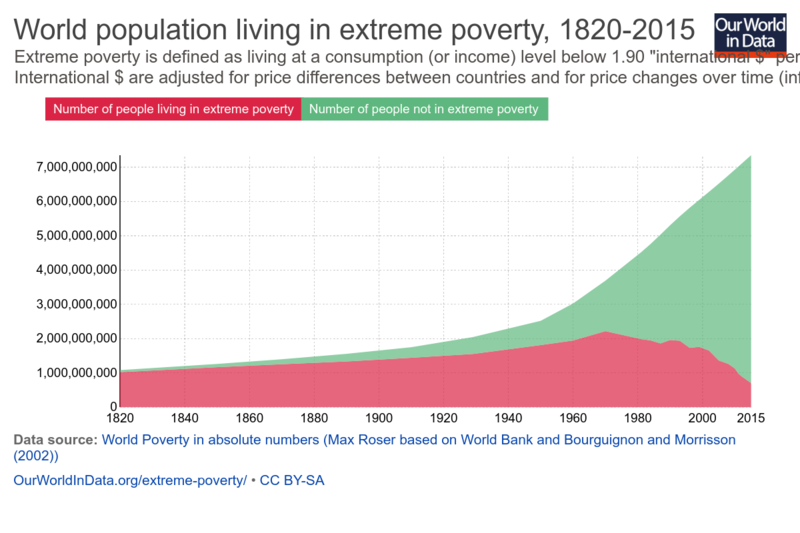 In a fascinating article titled “Global Extreme Poverty”, economists Max Roser and Esteban Ortiz-Ospina of the OurWorldinData.org website, document how world poverty has plummeted over the last two or three decades. This is not, of course, an argument to say that globalisation has reduced extreme poverty, but it is enlightening since many people believe just the opposite. 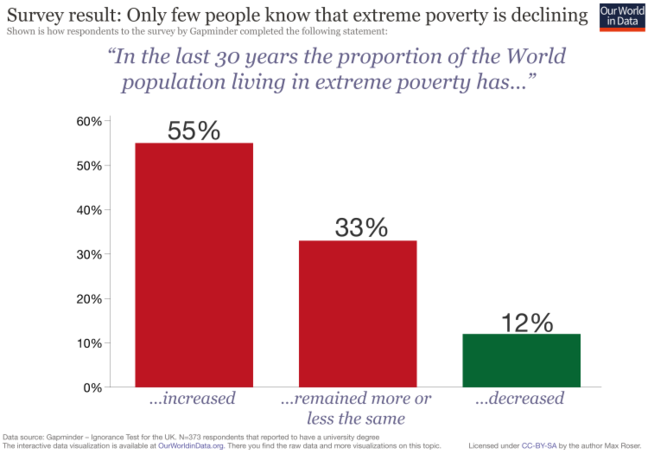 For example, a survey done in Britain found that the majority of people believe that extreme poverty has increased worldwide. Almost 90% thought it had increased or stayed the same, only 12% thought it had fallen. From the 1970’s onwards the pink area (those in extreme poverty) has declined at an accelerating rate whilst the number in the green (not in extreme poverty) has risen steeply from about 1960 onwards. (Extreme poverty is calculated as having to subsist on wages of $1.90 a day). Baldwin posits the theory that was discussed by my fellow students that in fact, the world has the potential to eradicate poverty and that we are learning to exist and cooperate at an international level. Indeed we may still achieve the Utopian vision that Roddenberry put forward in the 1960’s. It is an interesting point, which runs parallel to Steven Pinker’s assertion in his book “The Better Angels of Our Nature” that despite the violence of terrorism and continuous wars in places like Syria, we are actually, as a human race, becoming less and less violent. Pinker and Baldwin may be considered apologists for rampant capitalism or they might have a point that capitalism could prove the handmaiden of a better world in the future. I have my doubts but I feel that they deserve to have their point-of-view and we need to consider the weight of their arguments. This blog post is different from the rest because I’ve actually dictated every single word of it into my iPad. I have been trying to see how I can write a post using just words that I speak. The iPad comes with an interesting option of being able to dictate words which are then typed onto the empty page in front of you. There is a certain wonder to all of this. I must admit the main reason I have had difficulty in the past few months writing any posts is because of the sheer difficulties of typing on my laptop or on my tablet. The older I get the more I get fed up with the mechanics of writing particularly the thumping away on a keyboard making loads of mistakes and having to go back and correct each one of these and every now and again in finding that hitting the wrong button could suddenly lose everything!Most of you reading this will appreciate how I feel and how all that hard work can be lost so quickly and you regret so much that you did not back it up as you went along. The difference now is that I see what I write as I speak make it and I’m able to correct it afterwards only to the extent that it made simple errors based on my rather difficult pronunciation. So far I have found this extremely easy process, the problem of course will come when I realise that speaking is a totally different process to writing. I have in the past seen many people professional writers who are able to dictate to secretaries and type it’s a very able and interesting piece of work that later becomes a book or a story or a published article in a newspaper but actually having gone through the process in the last few minutes I’ve tried to make it a reasonably interesting Post using only my voice. Not typing at all is not all that easy but having said that sometimes the words to flow and I’m able to see in front to me the absolute wonder of a piece of writing created from just my dictation. My feeling on this is that this first experiment has been something of a success. I suppose I haven’t actually written anything other than my reflection on the process of creation using only my voice but, and this is a very big but, it has been remarkably easy, has been remarkably quick and I have been able to write something or dictate it right onto the screen. It has been wonderful to see the words that I say actually printed in front of me as I speak. I hope in the future to be able to actually write some sensible posts using this process. I think probably I will need to work out what I’m going to say before I dictate, so a plan or some bullet points would be needed. I really feel though that this is going to be a very useful process and hopefully it will lead to me being able to “write” a lot more in the future for your edification. I have recently come across this excellent infographic that explains so much about human development and the various climates that we have lived through. The thing to do is to scroll down to the last 200 or so years and see how economic growth has contributed to a rightward movement in the Earth’s average temperature. Compare this to the very long almost strightline that covers thousands and thousands of years. The dotted lines show scenarios that may happen.